The Middlebury Inn has welcomed guests to this central Vermont shire town for more than 185 years, establishing a tradition of hospitality, comfort and friendly service unmatched in New England. But the true history of the Middlebury Inn is not in a specific year, it’s in the details; the hallways of the main building wander and dip, the original front desk graces the grand lobby, and each guestroom has been outfitted with restoration wall coverings, high ceilings, brass fixtures, and period moldings. This charming historic property was built in 1827 when Nathan Wood opened the Vermont Hotel, a brick "public house" or pub. 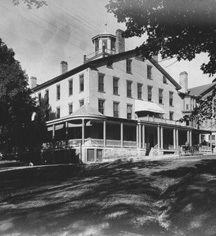 In 1852, the inn was renamed the Addison House and underwent renovations in 1865 under the new management of owner Darwin Rider. Rider was a gracious host, running a free carriage service to all trains and operated a large livery for guests. In 1897 the Addison House was purchased by Robert Cartmell and Allen Calhoun, who ignited a series of extensive renovations that included the addition of three floors, the installation of baths, electric lights, steam heat, a new kitchen, and dining room. In 1925, the hotel was sold to Middlebury Hotel Corporation, a stock company comprised of local businessmen, and underwent further remodeling. 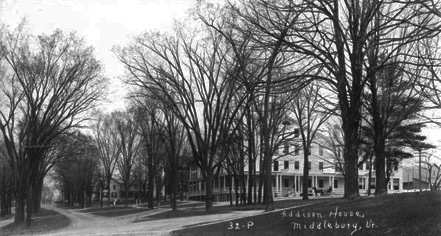 The hotel reopened in 1927 as The Middlebury Inn, hosting a gala to celebrate the occasion. Adjacent to the main inn, the two-story Porter Mansion is also part of The Middlebury Inn. Built in 1825 for local merchant Jonathan Wainwright, the stately brick structure was named after William Porter, who eventually resided there with his family. Affording nine guestrooms decorated in Victorian style, a lovely curving staircase, fine leaded glass entrance, exquisite marble fireplaces, and intricate moldings, the Porter House offers a historic luxury that enriches the treasured charm of The Middlebury Inn. The inn's modern annex buildings were constructed in 1968 under the management of the Treadway Company. Read more about the history of The Middlebury Inn, as told by Historic Hotels of America 2014 and 2015 Historian of the Year Stanley Turkel. Excerpt is taken from his latest book Built to Last: 100+ Year-Old Hotels East of the Mississippi (AuthorHouse 2013).